One hat still need a pompom—but is otherwise finished. 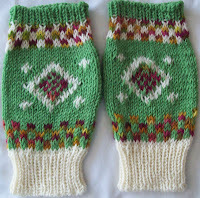 The fingerless gloves have all the ends (a seemingly endless amount of ends!) all woven in, got a good soak to relax the fibers,and are now lying flat to dry. The Noro vest fits and feels much better with its little cap sleeves—they were just the thing! It fits and feels so much better, I am no sure I want (or will add) anything (I-cord ties) to make a front closure. Going on a half dozen little flowers have been knit— and at least an other half dozen to go—along with some other little knits—and a knit kit or two for a Punk Crafts Fair at the end of the month. This is part of my DD's effort to keep me hip (a thankless task—I never was hip, or in with the in crowd, or popular--and never much cared)--and to promote my knitting career (such as it is). But black roses are interesting- and knitting is becoming more and more popular--so ready made knit roses, and patterns (and kits) for the same will be for sale. There are still other odds and ends and UFO awaiting my attention... so slowly over the next few days the odd UFO will be posted. If (and likely I will) I grow antsy—well there are simple hats to knit—There is always a hat! Yarn remnants seem to be the most excellent way to make small beautiful gifts - what other remnants have such a pleasing result? Those little flowers are very pretty - care to disclose how you did them? Thanks for all those interesting blog posts - you surely are hip at heart, and I should know! Flower Child and all that!